The 7 Best Places to Celebrate St. Patrick’s Day in North Dakota! Whether your blood runs Irish green or you simply love a good party, St. Patrick’s Day is a day of revelry and cheer. 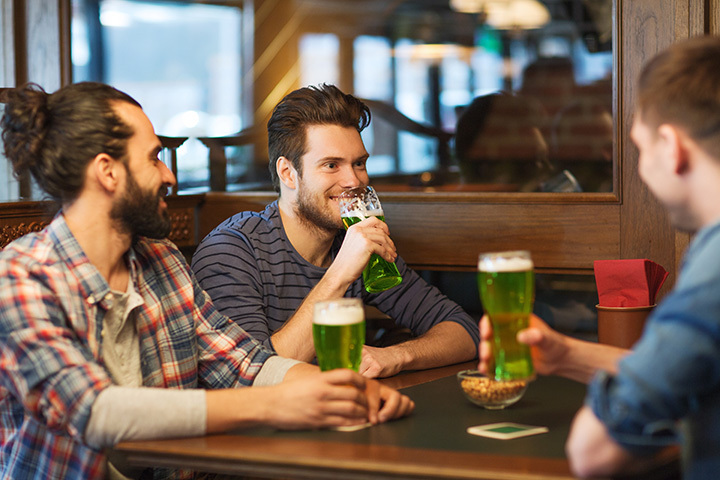 Although most establishments will have plenty of green beer flowing, there are a few places that pull out all the stops when it comes to March 17. We’re here to help you start planning your celebration. Don’t forget your “Kiss Me I’m Irish” shirt. The Fargo-Moorhead St. Patrick's Day Parade has been a staple in the Red River Valley for two decades. With over 100 floats and plenty of candy to go around, this family-friendly event will help everyone in your group channel their inner leprechaun. The parade begins at 7th Street and Center Avenue and ends on Broadway and 4th Avenue. Named after the great Irish-American boxer Jack Dempsey, Fargo’s original Irish pub serves a full Chicago-style menu, including artisan pizzas with unique flavor combinations like The Meyer (Canadian bacon, kraut, and pineapple), Pine-A-Roni (pepperoni, pineapple, and jalapeno), and The Meathead (pepperoni, Canadian bacon, and Italian sausage). The restaurant is also known for its wide selection of tap beers and cocktails as well as its nightly entertainment, which includes trivia, live music, and karaoke. With an authentic Irish atmosphere, over 35 draft beer selections, and a menu that will have you seeing green, Blarney Stone should be a top destination for your St. Patrick’s Day celebration. Appetizers like Irish nachos, mussels malone, salmon lox, and Emerald Island dip will help get the party started while entrees like Guinness Irish stew, bangers & mash, corned beef & creamed cabbage, and Kilkenny cod will finish you off. Must be 21 years of age to enter. With over 20 European and American beers on tap and a full menu that includes both American and Irish cuisine, you will be sure to find something to for everyone in your group. Famous for its Bloody Mary, Three Lyons prides itself on providing an authentic atmosphere within which to enjoy Irish eggrolls, shaved steak sliders, or delicious mini Beef Wellingtons. Wash your meal down with a Guinness or Murphy’s Irish Stout and you will have yourself a party. If you are looking for a party atmosphere, O’Really’s Irish Pub should be on your list. The pub specializes in signature cocktails such as like the Irish Spring (Powers Irish Whiskey and peach schnapps with orange juice), the Leprechaun (Wolfhound Irish Whiskey, dry vermouth, crème de menthe topped with an olive), and the Shamrock (Jameson Irish Whiskey, Kahlua, Bailey's Irish Cream Whiskey). O’Really’s also has one of the largest beer selections in the state. Ebeneezer’s has been serving up authentic Irish food since 2000. Specialties includes the corned beef Reuben sandwich, bangers & mash, shepherd’s pie, and mussels. Feeling adventurous? Try the peanut butter bacon melt or the Angry Frog (A big hoagie bun stuffed with chicken strips, bacon, mozzarella cheese sticks, pepper jack cheese, buffalo hot sauce, and jalapeños). A full drink menu is also available, as is a special kid’s menu. Attached to the Biltmore on Main, O’Kelly’s has been a local favorite for many years. Although O’Kelly’s menu that is a bit more American than Irish, the bar and grill still knows how to throw a party. Whether you channel your inner Irishman or stay with the local cuisine, O’Kelly’s will help you celebrate St. Patrick’s Day in style.